Let’s not beat around the bush- if you bought the book, we’d be super stoked. You can purchase your very own copy of Peripheral People in trade paperback or the ebook format of your choice at any of the following fine booksellers: Riptide Publishing : ARe : Amazon : Barnes & Noble : iBooks : Your Local Bookseller – The paperback is available through standard distribution channels, and your local bookstore should be able to order it for you. If you’ve read our books and enjoyed them enough to do so, tell other people about them! Twitter, Facebook, Goodreads, or just a friend or two who likes a good story. We appreciate it each and every time someone recommends our books to a new person. Feeling generous? You could buy a copy of Peripheral People for a friend- we all know that a friend who gives books is a friend for life. For that matter, many shelters, libraries, and school libraries would love a donation. Do you blog, or have a lively Facebook, tumblr, or twitter presence? Want us to come visit you and bring prizes? Contact us at ylendrianempire (at) gmaildotcom and we’ll set something up for you. We’ll answer (almost) any question you want to ask us, and we have fun stuff to give away, including books, swag, and gift certificates. If you’re not feeling spendy, no worries- Peripheral People is in circulation in many library systems! If it’s not available through your local library, asking your librarian how you can request it is an awesome way to make them aware of the book, and the demand for diverse fiction in general. Leave a review of Peripheral People or one of our other books somewhere- Amazon, Goodreads, your own blog, twitter, or the dust on your back windshield- whatever floats your boat and doesn’t get you in trouble is fine by us! Do you attend conventions? 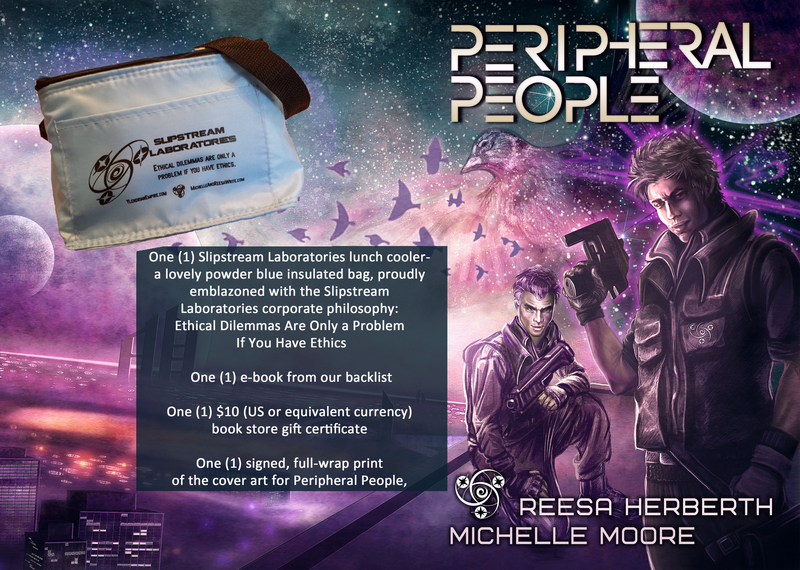 Are you interested in having Michelle and Reesa, or other authors of diverse sci fi/romance appear at conventions you attend? Request panels that highlight queer speculative fiction, or romance featuring queer and POC characters. Offer suggestions for authors you’d like to see speaking about those topics. If you’d like to hang out with us, we’d like to hang out with you. Hit us up on twitter – @reesah and @marigotc, respectively, and tell us about your favorite books. I don’t mean spam us with a thousand and one empty promo tweets- tell us why you think our readers would like XbookX. If you bought our book and liked it, please take a moment to tell us! We’re frequently available on various social media outlets (listed below), and knowing someone loved what we wrote is like food that nourishes us through the writing of the next book. If you’re too shy to say hello, please know that we appreciate every single person who spent their valuable time and money in our worlds, and we don’t bite. We got a stern warning from our teachers about that back in kindergarten. Where can you find Michelle and Reesa online? and any comments left here! Thank you for helping us count down to our release date- now you can enter the contest to win our awesome prize package! Contest submissions open May 10, 2015 through May 24, 2015. Winner to be announced May 25, 2015. Contest open to US and non-US residents. Shipping for physical items will be paid by the authors; any duties or taxes due upon delivery are the responsibility of the prize winner. Winner will be notified via email, as well as announced on this blog and various social media outlets. Eligible entries must contain the correctly descrambled phrase, contact name, and valid email address. Winner will be chosen via random number generator. This entry was posted on Sunday, May 10th, 2015 at 08:00	and tagged with contests, Peripheral People, ylendrian a-z and posted in Contests, Peripheral People, Ylendrian Empire. You can follow any responses to this entry through the RSS 2.0 feed.